Turkish President says delivery of Russian missile defense systems could be earlier than initially planned. Turkish President Recep Tayyip Erdogan said on Wednesday that the delivery of the Russian S-400 missile defense systems could be earlier than initially planned, AFP reported. "The S-400 missile defense system was to be delivered in July, maybe we will bring this forward," Erdogan was quoted as having told Turkish journalists on board his plane after a Russia visit, the local Hurriyet newspaper said. 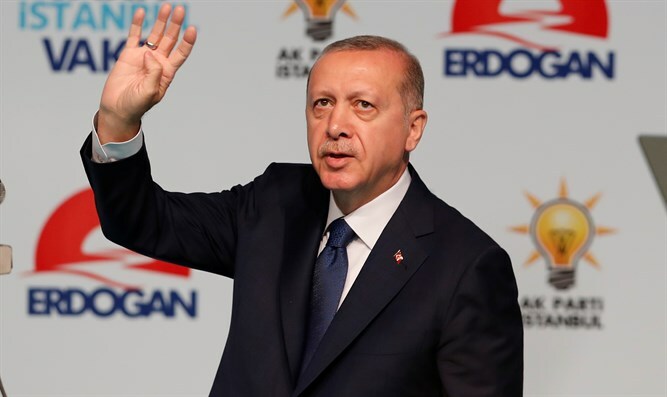 "This step that we have taken for our country's security neither targets a third country nor does it give our sovereign rights over to a third country," Erdogan said. The US believes the S-400 sale is part of Russian efforts to disrupt the alliance amid Western concern over Erdogan's burgeoning relationship with Russian President Vladimir Putin. US officials said last week that Washington had stopped delivery of F-35 fighter jet parts to Turkey in response to Ankara's decision to move ahead with the purchase of the Russian surface-to-air missile system. Turkish officials insist that the deal to purchase the S-400 does not affect the security of the US and have stressed that they will go ahead with the deal despite Washington’s objections. "If the United States does not want to sell the Patriot, tomorrow we can buy a second S-400, or another defense system," he was quoted as having said during an interview with the local NTV broadcaster. He said Turkey did not only need the S-400s but also "other defense systems".